Posterior nasal spine is created where the two horizontal plates combine at the midline as well as protrudes back from the edge of the hard palate. 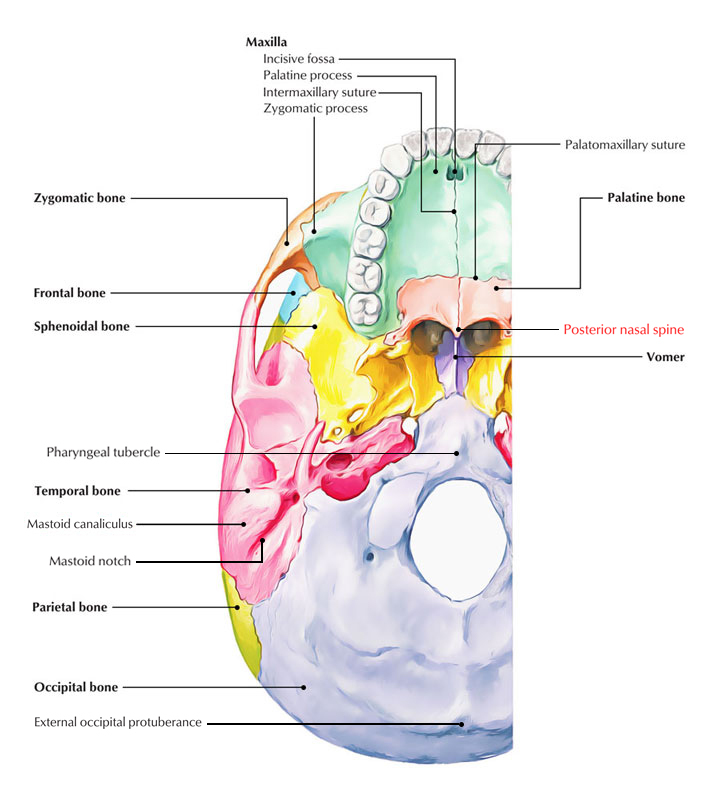 The posterior margin of the horizontal plates along with the posterior nasal spine is related to connection of the soft palate. Posterior Nasal Spine also has variation in length and width similar to anterior nasal spine. Posterior nasal spine is difficult in order to trace on the cephalogram when there is unerupted teeth, then the posterior nasal spine can be found in the middle of the floor of nasal cavity as well as the inferior side of the palatine bone. Posterior nasal spine is utilized in the construction of occlusal plane as one of the reference points. It is utilized for the evaluation of horizontal development pattern by means of FH-Palatal plane angle.